Whether you have a few stylish square frames to fill or a couple of 4×4 prints you want to add your family album, our square prints can be printed with either a glossy or matte finish. Just upload your photos, select a size and place your order in minutes. Enjoy stunning square photo prints delivered right to your door! Maybe you want to frame a square 12×12 print, or you need 5×5 photo prints to add your Instagram favorites to your family album, RitzPix makes placing your order fast and simple. Just upload your photos from your phone or computer and choose your sizes and quantities. Before placing your order, you can even customize your own cropping to perfectly frame your subjects. Not only do we offer square photo print sizes, we have a whole range of print options from wallet prints to photo poster enlargements. Order photo prints with ease and leave the rest to us! Like many of us, you probably have a large collection of Instagram photos of your treasured memories. With RitzPix, you can easily upload your Instagram pictures and transform them into stunning prints that you can frame, gift or add to any photo book. Whether you like Instagramming snapshots of your friends, natural landscapes or simply everyday moments, our square prints are perfect for keeping your Instagram memories safe for years to come. Give them a classic, vintage look with white borders or choose from glossy or matte photo paper. Or, print out an Instagram poster collage to celebrate up to 77 photographic favorites! We have all the custom options available so you can print your Instagram photos to your liking! When you order photos online you’ll keep your memories alive for years to come. Our square prints are perfect for celebrating your favorite photos and we have sizes that are just right for your home album. Our 4×4 photo prints are a great way to show off your best family portraits and can be arranged on one page together for a cute vignette of memories. Add a personal touch to your home by displaying your favorite photos! Our square photo prints look great in a stylish frame and are sure to brighten any room displayed in an elegant arrangement on your wall. Print your most cherished moments, snapshots of your kids and even your favorite Instragram memories and showcase them in an unique frame. We have several sizes that are ideal for your wall décor. Commemorate your special day with photo enlargements online. Wedding photos are cherished keepsakes that are handed down through the years from generation to generation. Our simple online photo developing process makes it effortless to transform your wedding memories into high quality photos. Our square photos are no exception. Print your wedding day favorites of yourself and your spouse on square pictures in an array of sizes. Maybe your want to share your wedding photos with friends and family. Print some 4×4 glossy photo prints and hand them out to loved ones at your next get-together. Or, frame a beautiful 12×12 enlargement of your best moment from your wedding day to proudly showcase it year after year. At RitzPix, we have all the options you need to order enlarged prints in a range of sizes. Not only do we offer classic sizes and poster enlargements, we have several square photo options available for any occasion. So, go big or go small! Our 4×4 glossy photo prints can be ordered with classic white borders for a vintage look. Artistically showcase them in a traditional album with photo corners and regale your friends and family with a stunning photo book that’s reminiscent of yesteryear. Looking to spruce up your décor instead? 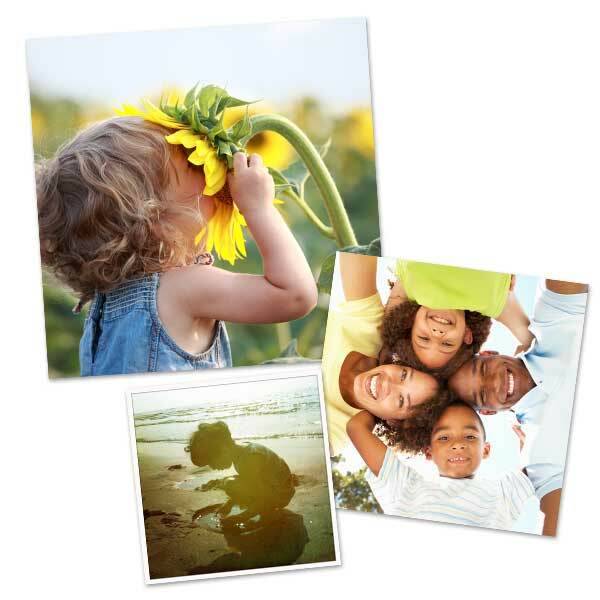 Order 8×8 photo prints or 12×12 square pictures in minutes. Our large square photo prints are ideal for framing. Set them in an easel back frame or hang them on your wall to add a little character to your home. With our range of sizes, you can print square photographs for any project on your list. Just upload any photo to RitzPix to get started! Like we’ve said, there are so many great occasions to print pictures, including square prints! We have sizes both small and large and ordering takes only minutes. Whether you’re looking to add to the album on your bookshelf or you want to display your favorite photos in frames, our square picture prints are guaranteed to please! There’s also dozens of creative ideas like making your own photo tile collage or pinning your favorite Instagram memories on a bulletin board to display by your desk at work. No matter how you decide to show them off, they’re a great way to celebrate your memories and bring them to life. With all of our custom options including print sizes, cropping and photo paper selections, you can’t go wrong!